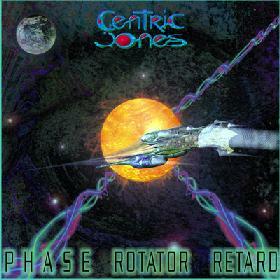 Centric Jones - "Phase Rotator Retard"
I’d like to start off by saying that I’m a big fan of Chris Fournier and his solo projects under the name Fonya. I interviewed Chris after the 1992 release of the first Fonya cd ‘Wanderers of the Neverending Night’. Since then Chris has released 5 more Fonya cd’s and we’ve become pretty good friends, even though we’ve never met. Chris is a very talented musician, who plays everything, but he just doesn’t sing. Centric Jones is a different project from Fonya only in the fact that there are vocals; Chris is joined by Dale Degen who adds vocals on 2 tracks. It’s kind of like an extension of Fonya, the music being very similar. A kind of spacey ethereal blend of chords and moods; very melodic. I’ve always thought that the best parts of Chris’ compositions is his bass and keyboard interplay. He gets these beautiful runs and textures from the combination of these two instruments. He’s no slouch on the guitar either, with some tasty little lead lines here and there. Even the drums are real, not wildly exciting, but they are more than just rhythmic time keeping. Overall, it’s a nice full band sound. Released by Chris Fournier and available from his website at: http://www.fonya.com. Gorgeous cover art by Thierry Guillemenot.